Please refer to our stock # T1830 when inquiring. 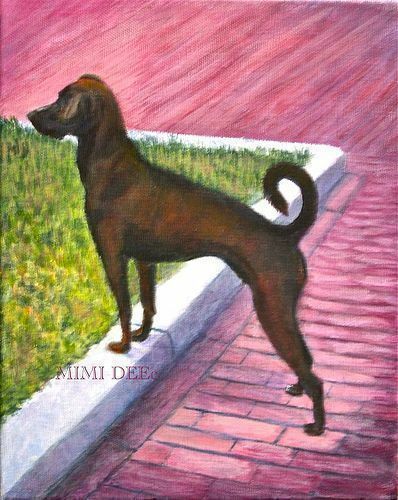 Commissioned portrait of a beautiful chestnut brown slim rescue shelter dog whose reversed dark spinal fur resembles that of a Rhodesian Ridgeback. When this painter spent time with her, Sofie struck such a stance as if reviving an ancestral show pedigree pose. This being Ms K's first baby...with a human one to follow within a year or so? Original work by this self learned painter who also forges sterling silver metal work studio jewelry, has been exhibited in various area artist association shows since the 90s and at the previously open Methuen studio store gallery by the same name.